If you are thinking about listing your spare space to rent out as storage, you are probably interested in getting to know more about the ‘Squirrels’ (i.e. the people who might be contacting you). 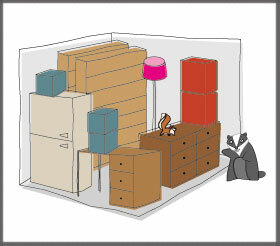 People are generally storing non-valuable household items and the average storage contract is 3 – 6 months. What is a Squirrel looking for? That’s a well packed room! 1. Good, safe access – The easier your space is to access, the more attractive it will be. This doesn’t mean loft hatches or three flights of stairs will put people off – for most people who want to store for a long period, as long as the access allows them to get the stuff in and out then that’s all that matters. However, we do encourage you to make access routes safe and easy to use. 2. Secure – if your space isn’t already lockable it may be worth thinking about ways of increasing the security (can you fit a small latch and padlock to the door or hatch?). This is less about a break-in and more about respecting that a Squirrel will feel more comfortable knowing that you appreciate the value of their stuff and the need to look after it. 3. Clean and tidy – it goes without saying that your space is going to be much more attractive to a potential Squirrel if you have given it a good sprucing up before they come and visit. 4. Accurate description – the more you put in your advert as a description the more likely you are to get a result from an enquiry as Squirrels will know exactly what to expect. Remember to describe the access route into the space when you write your description (include measurements) as this will affect the types of things that can be stored. Ready to make your listing? Super! Log in at Storenextdoor and get started with your listing. Remember if you need any assistance, please don’t hesitate to contact me at hello@storenextdoor.com. ← Straight from the Badger’s mouth – what’s it like to ‘store next door’?